At a time when millions of tonnes of foodgrains are rotting across the country due to storage crisis, tribal farmers of Jharkhand are safely storing their grains in the traditional mora. Made of ropes of rice straw, mora is an airtight container that safeguards grains against pests and rotting. In states like Punjab and Haryana, rice straw is treated as waste and burnt after harvest. Each family in Ranchi’s Aasri village has a mora. Resident Saraswati Devi says, “I have grown seeing my elders use mora. It is the only way we store our foodgrains.” Although the residents change grain in the mora every year, a single container can last three to four years. “Whenever we need grain to eat or for sowing, we make a small hole in a rope at the top of the mora, take out the grain and then tighten the rope again,” explains Devi. “The container protects grain from atmospheric moisture. No matter what the climate condition is, we never suffer losses,” she adds. Generally, the men make mora around rice harvest time. Women’s help is sought at the time of filling the mora with grains. The farmers list many advantages of the container. Making the mora requires hardly any money. It is prepared by the family itself. The raw material, rice straw, is easily available. Ganesh Chander Munda, who is in his early 20s, has seen his grandfather and father making mora. “It is a laborious job and takes around 14 to 15 days to prepare ropes. It takes at least three persons and two to three days to fill the grain in the container,” he says. A mora stores 3,000 kg to 5,000 kg of foodgrain. Munda adds that one has to be careful while starting the storing process. The mora preserves grains without the use of pesticides or insecticides. “One has to keep order of rope arrangement in mind because the ropes tighten the mora to keep it airtight. Disturbing the order can render the mora loose, spoiling grains later,” he explains (see ‘How to make a mora’). Mora is kept in the centre of the house to avoid any contact with moisture. The farmers consider mora so sacred that they offer prayers at the storage site and no outsider is allowed to visit. In case there is a visit, prayers are offered again. Will the Mora work in Mysore region? I presume it should work as the climatic conditions aren't any different from Punjab. Can you give me the contact details of a person who knows how to make this mora? I'd like to utilize his services to make one at our farm in Mysore and he can also give a training to a group of farm people in our region. It should work in Mysore too, 15-20 years back, we at Uttara Kannada used to have this done for storing the rice that was usually purchased in large quantity, that would be sufficient for the whole year including our farm labours. Used the similar technique. 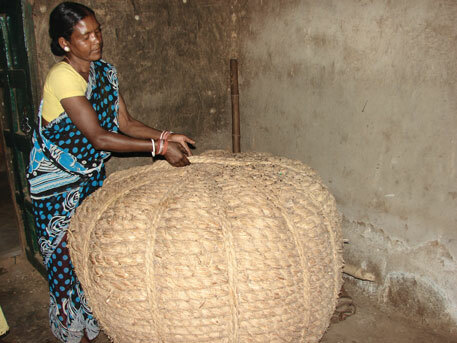 Its a art where only straw and cane ( ropes made of cane ) are used to created this round structure. I am afraid anyone really know this art anymore. Can you post a video on how to make a mora ? This seems to be a good technique. As said the advantages are many. Though it will taken quite some amount of time and labor for making the mora, considering it lasts for two to three years, it is profitable. I do hope to meet some one who can teach me this art.